Al Bahar Towers is an impressive twin tower complex located in Abu Dhabi, the United Arab Emirates. It is located at the eastern entrance at the intersection of Al Saada and Al Salam Street, in the city of Abu Dhabi. It is the new headquarters for the Abu Dhabi Investment Council. Its design is a combination of modern technology and Arab architectural elements. The innovative design used in the towers aim to help make the building more adaptable to the weather and the scorching heat in Abu Dhabi. The design for the Al Bahar Towers was a result of a design competition conducted by the Abu Dhabi Investment Council for their new headquarters. The winning design came from the architectural firm Aedas. Construction of the towers began in 2009. They were completed and opened to the public in 2012. 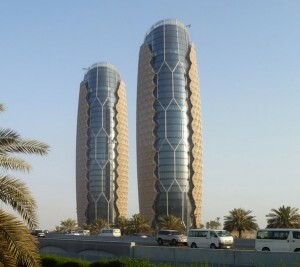 The Al Bahar Towers is composed of two similar towers constructed side by side. Both towers have a height of 145 meters. The towers consist of 25 floors each. The towers are quite distinctive because of their unique sleek facade composed of a series of high tech shades to keep out the heat and glare of the sun at various times of the day. The design features for the Al Bahar Towers were based on a contemporary interpretation of an age-old Islamic design element. The facade employs what is called a mashrabiya, a type of wooden lattice screen popular in Islamic architecture. It is mainly used as a means to achieve privacy as well as reduce the glare from the sun and the solar gain that can cause most buildings to heat up. 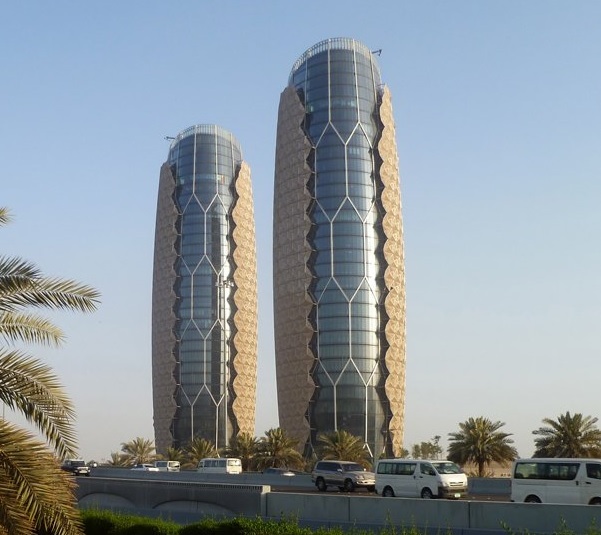 In the case of the Al Bahar Towers, the mashrabiya spans the sides of the towers that are most affected by sunlight. The umbrella-like structures are computer controlled to close and open according to the position of the sun at a particular time of the day. There are a total of 1,000 individual high tech sunscreens that make up the facade of the Al Bahar towers. The screens close up in areas where the suns glare strikes most on the two towers. They open up as the sun’s path moves away in order to let more external lighting into the building. In effect, all the screens open up during nighttime when the sun goes down. A distinct benefit that this high tech screen system provides is a more energy efficient building. Because of the facade, solar gain that usually heats up most buildings is reduced by as much as 50 percent. This allows the use of lesser energy to cool the building interiors to make them more comfortable. Use of external sunlight when the sunscreens open up also helps make the building use lesser energy for lighting the offices inside. The roofs on the south side of the towers also incorporate photovoltaic cells that can generate up to five percent of the energy needs of the tower complex. This generated energy is mainly used for heating water. For its many innovative features, the Al Bahar Towers is one of the first buildings in the Gulf to receive a LEED Silver rating. It also received the 2012 Tall Building Innovation Award given by the Council on Tall Buildings and Urban Habitat, which is based in Chicago, USA.